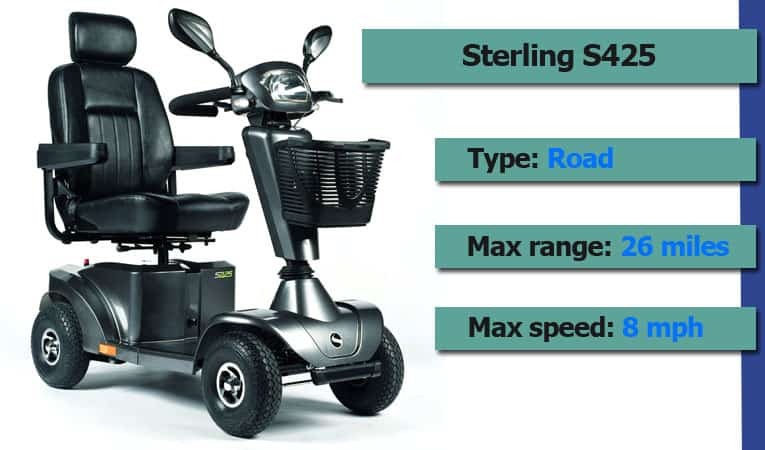 The Sterling S425 is designated as a Class 3 invalid carriage, which means it has an upper speed limit of 12 mph and is equipped to be driven on roadways as well as the pavements and walkways. It may be driven at a maximum speed of 8 mph on the roadway and at a maximum speed of 4 mph on footpaths or in pedestrian areas. It may not be used on motorways and should not be used on unrestricted dual carriageways where the speed limit exceeds 50 mph, but if it is used on these dual carriageways, it must have a flashing amber beacon. A flashing amber beacon should be used on all other dual carriageways. It must be registered but does not have to be insured. The operator does not have to be a licensed driver but must be over 14 years of age. The Sterling S425 Roadway Class Mobility Scooter offers style, comfort, and plenty of performance at a surprisingly affordable price. It’s versatile, dependable, and equally at home on the pavement or the roadway, with standard features that give a feeling elegance and luxury. It’s an outstanding value for its £1300 – £1700 cost, and it’s our pick for best roadway class scooter in the budget price range. The Sterling S425 is a fully-equipped class 3 scooter, approved for roadway travel at a maximum speed of 8 mph and for use on pavements and pedestrian areas at a maximum speed of 4 mph. Its 26 mile maximum range between charges makes it perfect for longer journeys, but whether you’re traveling across the town or across the street, the Sterling S425 is transport you can count on to make every trip a pleasure. Intelligently engineered with the user’s needs in mind, the Sterling S425 combines maximum comfort and accessibility with convenience and distinguished good looks. Its design is stylishly sleek and sporty, but every aspect is oriented to easy accessibility. It packs all the power that even an experienced user could ask, but its controls are simple and straightforward enough for even new users to master quickly. The Sterling S425’s combination of sporty style, luxurious comfort, and rugged dependability make it a unique entry in the budget price range. Amenities and comfort features that you’d expect to find in much more expensive models come standard on the Sterling S425. Four-wheel design and spring suspension keeps the ride smooth and stable over uneven surfaces. Pneumatic tyres reduce jolting, even over kerbs and bumpy terrain. The deep, fully padded Captain style seat offers luxurious comfort and increased support, and can be adjusted for width from 46 cm to 54 cm. An ergonomically designed delta handle bar with soft foam grip increases driver comfort. Lightweight alloy wheels create a narrow profile for ease of steering and good ground clearance. Sleek black body panels, deep metal mesh basket, and chrome bumpers make the scooter sporty, yet stylishly elegant. But a lot of what sets the Sterling S425 apart is built in for safety and ease of use. A complete front and rear light system and indicators make it roadway-safe day or night. A dual drive gives a choice of finger or thumb control. The seat swivels for accessibility and locks in place for security. The armrests can be set at custom angles and the 5-position tiller is fully adjustable. A freewheel mechanism disengages the power drive to allow manual operation. Braking system includes automatic regenerative braking, which slows the scooter to a stop, and automatic braking which operates seconds after releasing the control lever. Rear-view mirror and horn come standard. The Sterling S425 is a consummately capable roadway scooter that easily handles all the needs of everyday travel, whether it’s a quick trip to the shops or a daily commute to the office. Its generous 26-mile travel range allows for worry-free journeys without concern about running out of charge, and its slim profile makes it maneuverable even in relatively tight or crowded spaces. Though it has plenty of speed and power to satisfy experienced class 3 drivers, this model’s compact design, user-friendly controls and moderate price also make it an excellent choice for users who are new to road legal scooters. It’s comfortable, customizable, and easy to operate on roadways and walkways alike, and under certain circumstances it may also be usable indoors. The Sterling S425 can be used indoors in some circumstances, but it is primarily intended for outdoor use. While it can be disassembled and folded to some extent for storage or transport, it cannot be considered a portable mobility scooter. The Sterling S425 has plenty of power and can traverse uneven surfaces, but it is not intended for use on very soft or muddy land, high grass, or steep inclines or slopes. This product is available at eBay, Amazon.co.uk. At ebay.co.uk you can purchase 125 Key Mobility Scooter Sterling Series S400 S425 S700 #125 for only £3.99, which is 100% less than the cost in Amazon.co.uk (£1,939.90). The lowest price of Sunrise Medical Sterling S-Series S425 Mobility Scooter was obtained on March 30, 2019 6:33 am. The Sterling Diamond is a real standout among similarly priced vehicles, combining lots of luxury features with comfort, ease of use, and quality construction; it ticks all the boxes for an outstanding budget price roadway mobility scooter, plus a whole lot more. Whether you're new to roadway class scooters or a seasoned veteran, the Sterling Diamond is a great choice at a great price.